Xfer Records' Serum is without doubt one of the most powerful, sonically impressive soft synths to date, thanks to its versatile wavetable architecture, stunning filter, wild modulation and knock-out effects. 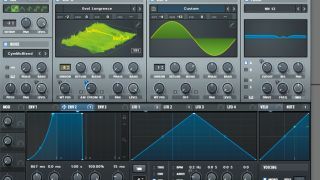 The ability to modulate wavetable position and Warp make Serum a monster synth for drum ’n’ bass, with an incredible amount of moment-to-moment variation brought to bear via only the most rudimentary of parameter tweaks. In this tutorial, we'll walk you through the programming of a Reese-style patch fit to get heads nodding. For more power synth tutorials, pick up the May edition of Future Music. Step 2: The synth’s Mono and Legato are on, and Portamento is at around 12 o’clock, giving us a bending, gliding effect. The patch’s core movement is created via LFO 1’s slow, unsync’d modulation of Osc A’s WT Pos knob, which is scanning through Osc A’s gnarly wavetable. Step 3: Old-school DnB ‘wobble’ basses often have a distinctive change in speed when played up and down the keyboard. To replicate this, Osc B (a sine) is modulating Osc A’s amplitude via Osc A’s Warp mode, set to AM (from B). A slow-attack envelope increases this Warp amount over the course of each note. Step 4: Head over to Serum’s FX tab, and you’ll see that the insert effects we’ve dialled in are huge contributors to the bass’s aggression and character. Heavy compression is placed after reverb, causing it to swell out between notes. There’s also forceful distortion, careful EQ and widening going on. Step 5: Back to the Osc panel. For fizz, Serum’s Noise oscillator is pushing additional high-frequency noise into the final distortion stage; and the sub oscillator is adding solid low-end to the overall sound. Finally, note the filter: we’re modulating a double notch type for even more sweeping motion. Step 6: LFO 1’s Mode is set to Off, so our wavetable modulation is constantly evolving. This means that each bass note has different modulation. Therefore, for more consistency, it’s a good idea to print a good few minutes of a programmed riff as audio, then chop out the very best takes.